The MO300 is a pinless moisture meter with Bluetooth. This meter transmits key environmental readings to Android mobile devices. The MO300 measures moisture, humidity, temperature, vapor pressure and dew point. 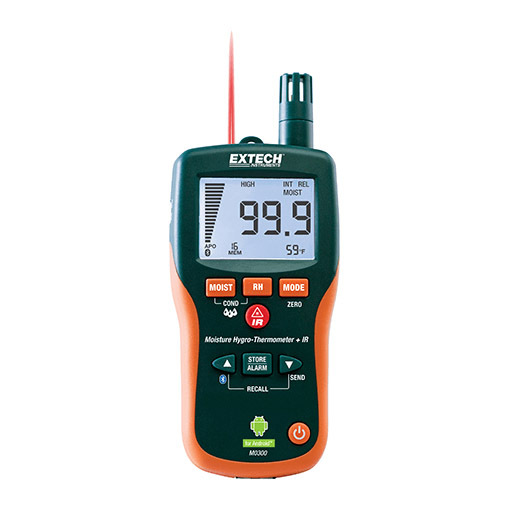 Quickly indicates the moisture content of multiple wood types and other building materials with pinless technology without damaging the surface; remote pin-type probe allows for contact moisture readings. The MO300 features manual storing/recall (20 labeled readings) or datalog (50K readings) using the Android app, large dual display with automatic backlight and fast analog bargraph, programmable high/low moisture/humidity alarms, IR circuit to measure non-contact surface temperature, automatic calculation of differential temperature, min/max modes, data hold, and auto power off functions. Product is complete with pin moisture probe (MO290-P) and 3ft cable, 9V battery, user’s manual and pouch.